Multi Commodity Exchange of India Ltd (MCX), India’s No. 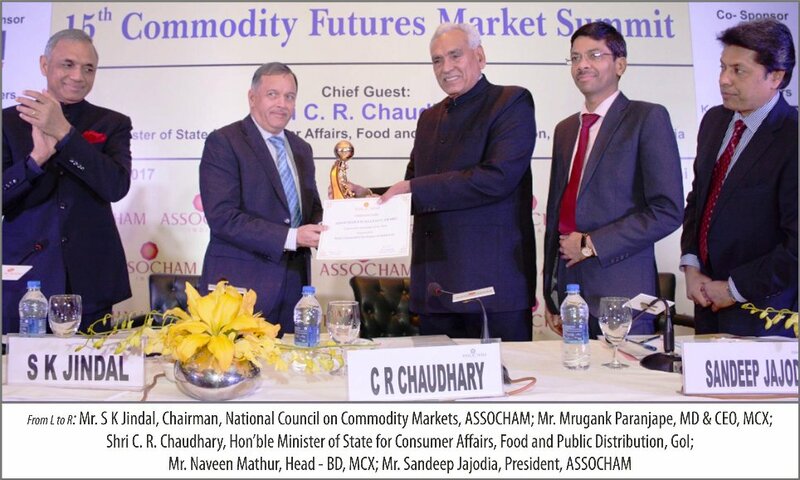 1 commodity exchange has been named ‘Exchange of the Year’ by ASSOCHAM at their 15th Commodity Futures Market Summit & Excellence Awards. The awards ceremony held today in New Delhi recognized MCX’s excellence in offering diverse product suite, providing a robust and efficient platform for price discovery and risk management, and its pioneering efforts at inclusion and market development. The award was presented by Shri C. R. Chaudhary, Hon’ble Minister of State for Consumer Affairs, Food and Public Distribution, Govt. of India to Mr. Mrugank Paranjape, MD & CEO, MCX. MCX offers a diverse portfolio of risk management products and has seen strong growth across its products in the base metals, bullion, energy and agri segments. During the year 2016, Multi Commodity Exchange of India Ltd (MCX) witnessed a period of growth and development, despite the numerous challenges faced by the Exchange arising from international and domestic factors. The total turnover of MCX during the year 2016 was Rs.61.12 lakh crore, an increase of more than 10 percent from 2015. MCX’s market share increased from 84% to 90% over the same period. This feat was achieved despite a prolonged strike by jewellers, cancellation of the ‘legal tender’ status of high-denomination currency, continued depressed prices of crude oil and such challenges. In the process, the Exchange could maintain its undisputed leadership position in the Indian commodity market space. “As the global commodity markets become increasingly connected and dynamic, risk management plays a growing role across commodity value chain participants as they utilise our products to manage exposure against volatile markets. We remain committed to expanding across our product range that are relevant to the ever-growing needs of our member community, and strengthening our infrastructure. Most importantly, I would like to thank our stakeholders, market participants, and our employees for their continued support and trust in MCX”, he concluded. “A review of process and procedure facing commodity markets calls for a more focused and pragmatic approach by government, regulators and exchanges for making it a vibrant segment for value chain members”, added Mr. Jajodia. “ASSOCHAM urges the government to allow more products and market players and also make our exchanges attractive to various stakeholders of the commodity market”, stated Mr. Rawat. Having commenced operations on November 10, 2003, Multi Commodity Exchange of India Limited (MCX) is India’s first listed, national-level, electronic, commodity futures exchange with permanent recognition from the Government of India. The current market share of MCX stands at 90%. MCX offers the benefits of fair price discovery and price risk management to the Indian commodity market ecosystem. Various commodities across segments are traded on MCX. These include bullion, energy, metals and agri commodities. The exchange has forged strategic alliances with various international exchanges, as well as Indian and international trade associations. For more information about MCX and its products visit www.mcxindia.com.